The proposal is based on five months of intensive consultations with the leaders since the resumption of the peace process this summer. "We are not coming in with an American plan that would be imposed on the parties, but rather we want to have a detailed consultation with them about these ideas that have been generated as a result of the negotiations between the parties themselves," one of the officials said. "The secretary's trip this time is to start to test those ideas with the two leaders." With direct negotiations between the two sides flailing, the United States seems to have moved into a more muscular role as mediator by presenting its own bridging proposals to the parties instead of relying on the Israelis and Palestinians to negotiate among themselves, which has born little fruit. When he visited the region last month Kerry and retired Gen. John Allen, who has been working on Israeli security issues, presented Israeli Prime Minister Benjamin Netanyahu with specific and detailed ideas on how Israel's security needs in the West Bank could be addressed in the context of an eventual peace deal with Palestinians. There will be no peace until all extremists around up locked up or killed . They just won't allow it . Hey, were's the paragraph describing what Kerry is wearing? Is he wearing Lanvin, Armani, Hugo Boss, etc.? You long drink of water you! for your information,there wouldn't be a so called palestin and israel problem if Palestin was recognize as a STATE, that is all palestinians want. Don't just comment just to comment but do so with a bit of knowledge. The Iranian regime has murdered its own dissidents we all are aware of that and to imagine that we might embrace an opportunity to be civil toward Iran may seem outrageous. The greatest danger I believe is to back away, to cower and discount the importance of any opportunity to have peace. We could listen to the conservative voices that have a questionable agenda including the undoing of all President Obama attempts to mediate for worldly peace but to persevere in spite of their negativism is an achievement worth noting. Are peace come from Israel and supporting them. War comes from being friendly with evil regimes that try to put down legitimate States like Israel. The Iranian regime has murdered its own dissidents we all are aware of that and to imagine that we might embrace an opportunity to be civil toward Iran may seem outrageous. The greatest danger I believe is to back away, to cower and discount the importance of any opportunity to have peace. I think that I am going to push back on this one! kerry's best job is married money-look at the mess overseas and HE WANTS IRAN TO HELP US GET PEACE IN SYRIA???? guess he stopped by Colorado and picked up some things to smoke. I does not have to be this way. We can have peace. Not under a President, or Prime Minister but in God's kingdom. We are all related as humans. We should love each other. John Kerry has been a second rate politician all his life. This has been done countless times before from individuals with diplomacy credentials that far exceed this Sec.of State. so you saying that Iran is the biggest democracy in the world you must be delusional or stupid.. Please keep telling the truth John. It is in the interest of Islamic countries to keep alive the Israeli-Palestinian conflict. Muslims use this conflict as an excuse to erase Israel from the map. Islamic rhetoric always use this conflict as the ONLY excuse to bash Israel. This is a waste of our time and money... They aren't ever getting along. This is such a crock that we spend this much time on this mess. If you want to save some money in that region stop giving away 5 billions dollars every year to Israel. You do not deserve that name. I take that name away from you spiritually. Go back to where you came from. framework is simple, bomb them all. No exception? You mean including Israel? if AIPAC is so powerful then why is it the jewish votes went to obama? When clearly obama is not a friend of israel. Or is their a disconnection between the American jewish vote and the interests of israel? Someone make sense of this for me. Is it time to call in Putin to resolve this mess? Together, Putin and Israel could resolve all issues. Since many Israelis are transplanted Russians, they have a lot in common. Since Israel controls most of our US Congress, Putin still has a chance to "bury us". Bebe loves his bulldozers, Putin could teach him how tanks work better! Israel's "issues" with Iran would disappear and the Palestinians carted off to Siberia! Problems solved! this makes more sense than the article…I'll go with this. Natanjahu and Putin working together? That's too dangerous, they will control the world in a year. HOW TO PROGRAM TO A NEUROLOGIST IN CNN. I NEED TO RUN A PROGRAN IN TROUGTH HIM NEURONS DAY AND NIGTH. BUT I NEED TO LIVE JUAN CARLOS VALLEJOS. Do you program people in hell? Deprogram yourself and become a person a nice spirit. 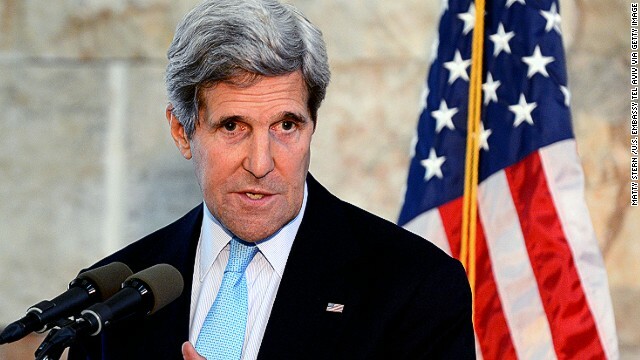 Both sides must know kerry is a military fraud, a man with no honor….how could that possibly benefit this process? Even clinton had more credibility, and she had little in their minds. There will be No Peace until ISRAEL stops taking land from the Palestinians and settlers leave the West Bank. Even Jewish people and Jewish Groups know this problem. It's not the Palestinians fault but Israel's fault. They want all the land of Palestine and will not stop until they take it all away. List of SOME JEWISH people and some Groups for peace with Palestine. Miko Peled(family originally from Palestine and father second highest General in the IDF), Noam Chomsky, Norman Finkelstein, Anna Baltzer, Anna Elliott, Rae Abileah, Thomas A. Kolsky, Jewish Voices for Peace, Jews for Palestinian Right of Return, American Jews Solidarity Against Zionism, Rabbis for Human Rights. That's just a few! Yeah, Israel wants all the land. That's why the Palestinians rejected an offer of around 90-95% of the West Bank and Gaza Strip at the 2000 Camp David Summit. Israel would have retreated from 63 settlements if a deal would be made. Give it a shot Mr. Kerry ,I`m sure the results will be the same unfortunately. Just follow God's will and there will be know evil intention here. "The deal is an easy one: Go back to 1948 Israel-Palestine borders." 1. Today is 2014 and NOT 1948. 2. The deal UN offered back in 1948 was REJECTED by the Arabs. Trying to revive is is no more realistic than getting a new top of the line 2014 Chrysler 300 for the discounted price of 1948 De Soto because back in 1948 your grandfather REFUSED to purchase the De Soto. 3. It is not possible to "go back" somewhere one NEVER was before. The borders the UN offered 65 years ago NEVER materialized. I'm sure that John Kerry is going to offer PEACE NEGOTIATIONS and I believe that the Palestinians (as always) will manage to assure that the negotiations will fail and that their war against Israel (and with it the occupation, the settlements and everything else Palestinians love to complain about) will continue. Are you for real? You telling me that if the un 1948 border deal was again put on the table, the Palestinians would reject it?? Of course they wouldn't! They'd take it in a new york minute. And you know it!!! So called israel would reject it vehemently and the yahoo would probably foam at the mouth if it was offered. Therein lies the continuing problem. fidel, you are extremely misinformed. The Palestinians already rejected 90% of the West Bank and all of the Gaza Strip in the 2000 Camp David Summit. 68% of Palestinians thought this the right decision. Palestinians would rather have no state then all over not having ALL of Israel. The peace process is absolutely futile if the Palestinians can't get over their hate and greed. In the meanwhile, the Jews will just move in. It's the Palestinians just reward for being so diplomatically arrogant. As a non-Jew, feel no sympathy whatsoever. The point is the Israeli people have rights of there own. You seem to be all about giving the Palestinians rights yet you seem to not include Israel in this new deal. If we want rights as a Country, we need to regard others rights as well. We do not have a right to hate speech, but we have a right under God. We need to appreciate everyone and stamp out the evil around us and let the good be seen again all around the World. How about you leave Israel alone. I know who you are and I know the game you play. I see that lie is in your name. Probably because y9ou lie! Israel is a free nation under God and they are known of you business. They should have all the land that God gave them in first place, before man decided to make there own arbitrary border. The deal is an easy one: Go back to 1948 Israel-Palestine borders. the virulent nature of the state of Israel should have been put in check a long time ago. Jimmy Carter, Finkelstein, and others have tried to do so, but no one listened. But, John Kerry is going to propose something?? And who is telling him what to say? AIPAC?